Damian Rashad Swann (born December 4, 1992) is an American football cornerback for the New Orleans Saints of the National Football League (NFL). He played college football at the University of Georgia. Swann was born in Atlanta, Georgia. He came from a rough background, but still played football, as well as playing baseball and basketball. He attended Henry W. Grady High School in Atlanta. He was heavily recruited by colleges and became the first person in his family to attend college once recruited by Georgia. Swann played for the Georgia Bulldogs from 2011 to 2014. He earned Associated Press Second-team All-SEC honors his senior season. Swann was drafted by the New Orleans Saints in the fifth round of the 2015 NFL Draft. He signed a four-year contract with the Saints on May 11, 2015. He played in seven games, starting two, for the team during the 2015 season. He suffered three concussions in a span of nine weeks and was placed on the injured reserve list with three weeks to go in the season. He returned to the team for training camp in 2016, but on August 31, 2016 it was reported that the Saints had again placed him on injured reserve, ending his season. 1 2 "From humble beginnings to the spotlight". georgiadogs.com. November 26, 2015. Retrieved April 7, 2016. 1 2 3 "Damian Swann". georgiadogs.com. Retrieved April 6, 2016. 1 2 "Damian Swann". pro-football-reference.com. Sports Reference LLC. Retrieved April 6, 2016. 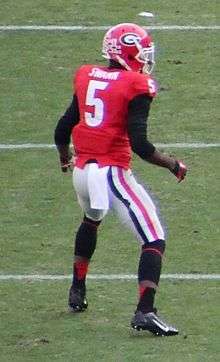 ↑ "DAMIAN SWANN". foxsports.com. Retrieved April 6, 2016. ↑ Erickson, Joel (June 25, 2016). "Second-year Saints cornerback Damian Swann believes he's put concussion problems behind him". New Orleans Advocate. Retrieved 2016-08-31. ↑ Dabe, Christopher (June 14, 2016). "Damian Swann undeterred by 3 concussions in rookie season with Saints". Times-Picayune. Retrieved 2016-08-31. ↑ Underhill, Nick (August 31, 2016). "Source: Damian Swann placed on injured reserve". New Orleans Advocate. Retrieved 2016-08-31.